Nothing says “vacation” like a colorful sunset over a sparkling body of water, and you simply can’t beat Lake Michigan for watching the sun slip over the horizon. 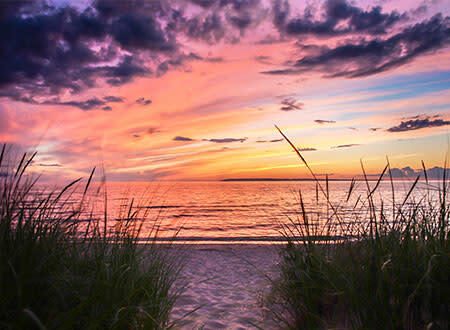 With miles of sandy beaches and unobstructed views to the west, Leelanau County offers the premier locations in the greater Traverse City area. With so many beautiful places to choose from, it was hard to narrow them down to just one, so we decided to share five of our favorites. 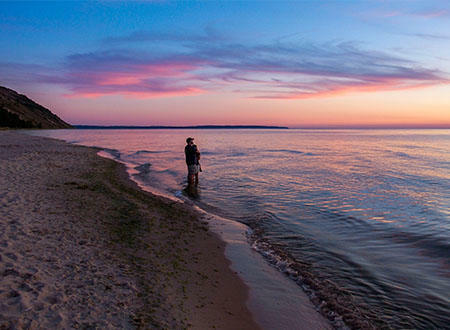 A longtime favorite of residents and visitors alike, Empire Beach might produce the most sunset photos of any spot along the area’s Lake Michigan shoreline. The spot offers a playground and access to South Bar Lake, endearing itself to both children and parents looking for a break. Pack a picnic and enjoy the evening at one of several picnic tables as the sun gets lower on the horizon. Metal bonfire rings are a great place to gather the crew for Mother Nature’s nightly show. 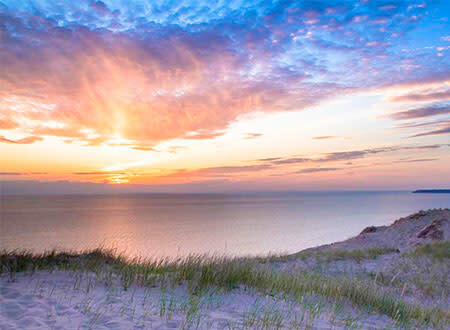 Located just north of Glen Arbor off of M-22, the Port Oneida Rural Historic District in Sleeping Bear Dunes National Lakeshore offers a multitude of sunset viewing destinations. Several stairways lead to the Lake Michigan shoreline. The vibrant sky at dusk can also be enjoyed while exploring one of the eighteen historic farmsteads. Either way, you won’t be disappointed by the magical feel this historical area offers. 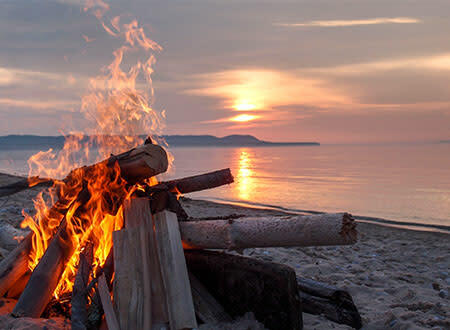 Nestled between Leland and Glen Arbor along the Lake Michigan shoreline, Good Harbor Bay is a favorite amongst the s’more connoisseurs. Visitors can access the bay at a variety of spots and relax by the fire after a late night swim in the more protected waters the bay offers. A short hike from the parking area near Glen Haven opens up to a panoramic view of the Sleeping Bear Dunes and Lake Michigan’s sandy shoreline. Alternatively, paddle your kayak south around the point after putting in at Glen Haven for a more unique vantage point. 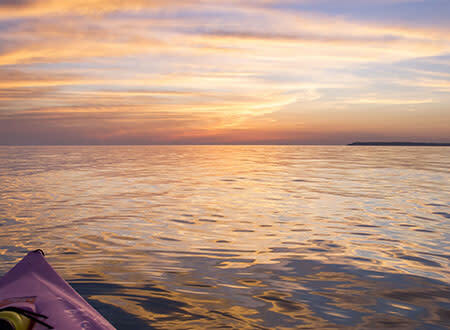 Arrive in late afternoon and enjoy a swim in the cool, clear waters of the “Big Lake” before taking in the sunset over Sleeping Bear Bay and the Manitou Islands. No visit to Sleeping Bear Dunes National Lakeshore is complete without a tour of Pierce Stocking Scenic Drive. 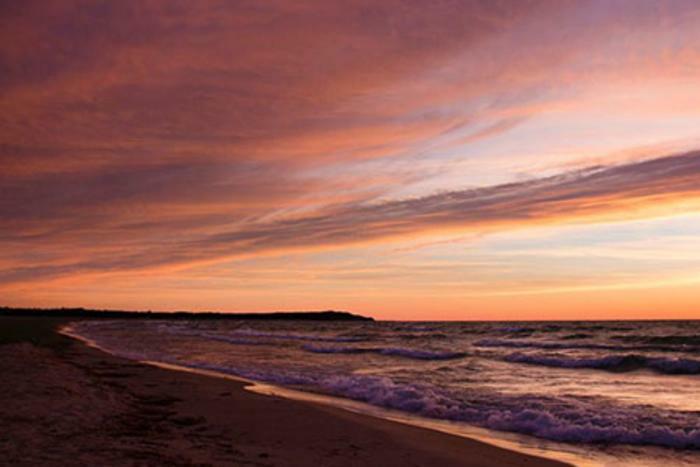 The smooth blacktop road winds its way through the wooded hills and towering dunes of Sleeping Bear, offering spectacular views of the Glen Lakes, Sleeping Bear Bay, and North and South Manitou Islands along the way. During the summer months the Scenic Drive stays open until half-hour after sunset, giving you plenty of time to enjoy the area. At the Lake Michigan Overlook, visitors are treated to one of the most spectacular views in the Midwest from atop the 450-foot face of Sleeping Bear Dunes. The view over the expanse of the dunes and the waves of Lake Michigan far below is a stunning location to take in a northern Michigan sunset. A word to the wise, though: resist the urge to run down the face of the dunes to Lake Michigan, unless you’re prepared to watch the sunrise the following morning during the loooong climb back up. Northern Swag is a collective group of Northern Michigan creatives that are obsessed with the incredible beauty of the area. In their eyes there's something else that evades description, a type of pervasive style that makes being here just feel awesome. It’s something you’ll notice not only in the fierce individuality of the people, but in the places and landscapes as well. It’s their goal to try and capture that unique Northern Michigan style, or swag, with photos and words. Love what you see? Take a moment to follow them on Twitter, Instagram or Facebook.